Notifications in Chrome OS are currently located in an expandable section highlighted by a bell icon. It's been this way as long as I can remember, but it looks like a change is coming. We recently saw a new system tray quick settings design in the Chrome OS dev channel, which can be enabled with the following flag: #enable-system-tray-unified. That same flag is now responsible for merging the quick settings and notifications together in the canary channel. As you can see from the image, the notification center seems to be tacked on to the top without much finesse. This is the canary channel, though, so this feature will be far from the finished article. With the rounded corners and overall design style (which some may refer to as Material Design 2.0), it looks a lot like the notification shade in Android P turned upside down. 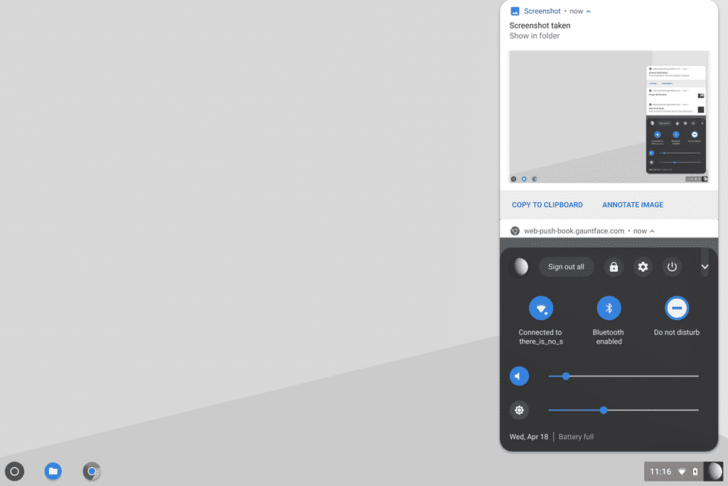 With Chrome OS tablets now on the market, it's not surprising to see the UX become more touch-friendly and more Android-like. We're likely to see further consolidation in the design of the two operating systems in the coming months, as Google moves towards a consistent experience across devices. The recently added quick replies and new power menu in Chrome OS are yet more examples of this. Since this latest change is only in the canary channel right now it'll be some time before it reaches the stable channel that most people use, and it will surely be refined further as it graduates to dev and then beta beforehand.